Gorgeous ceremony decorations make your nuptials as beautiful as the vows you say to one another. From simple yet sophisticated fabric ribbons to extravagant floral arches, you can create a space within your budget. Greet your guests for the festivities before they even get to the ceremony. 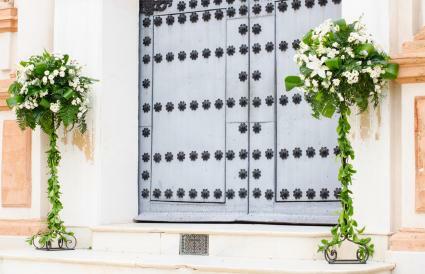 A large arch or swag around the entrance doors draws everyone's eyes to the front of the church and the proper entrance doors. While greenery and flowers may be the traditional choice for these, you can also decorate with balloons and fabric like tulle or even velvet. Difficult to find churches might need directional signs to help point guests in the right direction. Luminaries can line a sidewalk or stairs leading up to the entrance at an evening wedding. Vinyl wedding stickers in your initials, names or themed graphic are a unique alternative to hanging wreaths or bows on the door. Decorate seasonally, using citrus plants in warmer months, corn shocks at an autumn wedding and miniature evergreens in the winter. Columns with floral arrangements can be used year-round with seasonal blooms. The front of the church and altar area is where many of the posed professional photographs are taken. 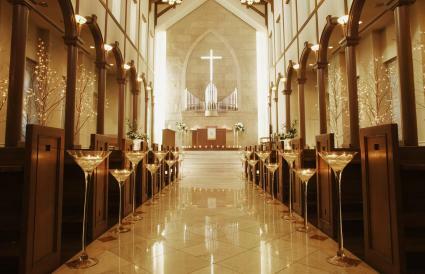 It is also where the bridal party stands during the wedding, so all the guests are directed towards this area of the church almost the entire wedding. Use moveable pillars or columns for wedding flower arrangements. An arch can be placed at the end of the pews before the altar area for the couple to pass through. Weave tulle and lights or green garland around stair banisters and communion rails. Add small white lights to any large trees or foliage that flank the altar itself. Rent two candelabras from a party supply store to place on either side of the altar if there are none in the church. Large sculptures can be rented and placed in the altar area, such as hearts or crosses. Position a small table for a unity candle ceremony in a space where it can easily be moved into view of all the wedding guests. 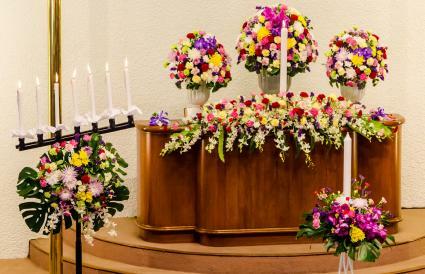 A lengthy spray of wedding flowers for church altars made with large blooms will dress up the actual altar. The altar is often considered a sacred part of the church, so be sure to double check with your religious leader if you are unsure about any decoration ideas you may have for this area. Pew decorations are traditional and an area where you can save significantly on your decoration budget. Making wedding bows to hang on the ends of pews is affordable and decorative, while candles with flowers and miniature bouquets with tulle are more expensive but still lovely. However, you're not limited to ribbons and flowers. 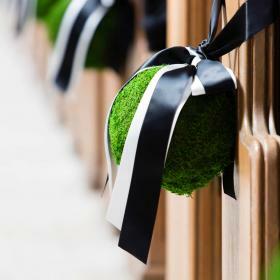 Consider modern cheap pew decorations like feathers with ribbon or a more expensive moss kissing ball with wide black bow. 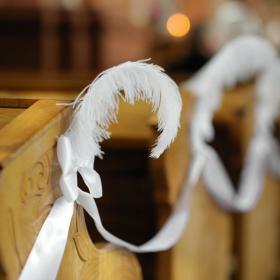 Items can be tied on with elastic bands/ribbons or with plastic hooks that slide over the pew's edge. Using adhesives, glue or staples is usually prohibited at most churches. Save even more money by placing decorations on every third pew. Decorating the aisle is more than just hanging up a pew decoration. 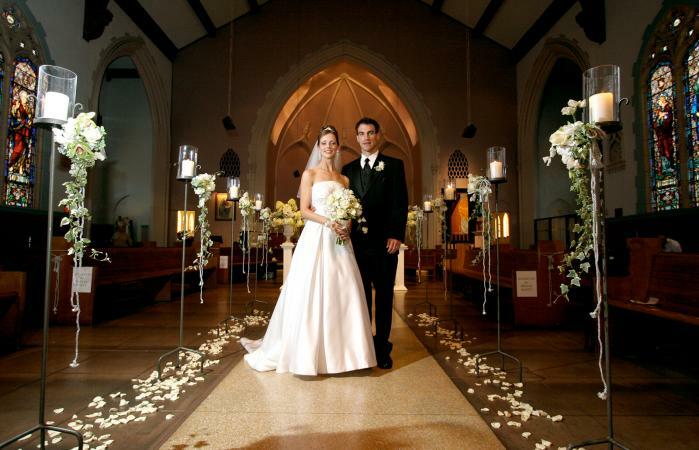 A simple church wedding decoration is an aisle runner in white, brown, black, or red. One may be available from the church. This can cover unattractive carpeting and add an air of elegance with almost no effort. Have the ushers put it down the aisle just before the bridal party walks to the altar. Couples who plan to use real flower petals might be required by the church to put a runner down before the flower girl walks down the aisle. Petals have been known to stain carpeting. Skip the pew bows and instead place large decorative columns at the end of each row of seating. Columns may be as traditional as white or tulle covered stands with floral arrangements or as unique as large acrylic displays with water. Add lighting to the displays for an evening wedding, whether LED candles hung from shepherd's hooks or floating candles in a water unit. Don't neglect the outside aisles, either; they are the perfect spot for branches with twinkling lights. The ceiling may not be on your list of areas to decorate in your chapel or church. Yet there are quite a few ways to enhance your wedding even further. Seasonal wedding flowers can be placed in an elegant vase or basket on the windowsill. 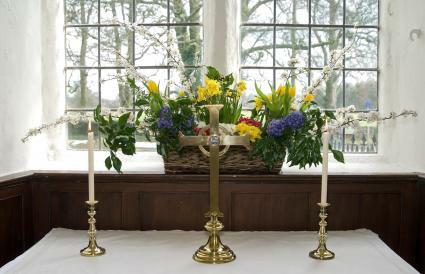 For more informal weddings, a whimsical holder may be appropriate for displaying flowers. Twinkling tea light candles in the evening against stained glass will create a dazzling effect. Tapered candles in varying heights can also create a lovely appearance. Honor your religious beliefs by placing a small standing cross on windowsills. Churches may have a balcony above the altar area, in the back of the church, or even outside the church. Church banners that feature related Biblical or other religious stories may be available for use at no charge and hung from the balconies. 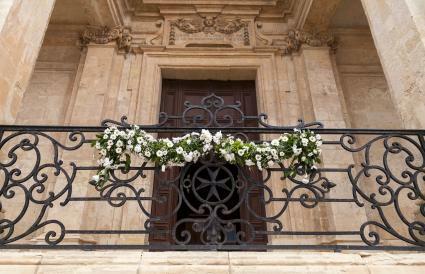 Tulle or ivy garlands may be swagged across the top of the balcony similarly to the altar railing. Nestle votive candleholders between garland sections on top of the balcony railing, or cover wedding light strands loosely with tulle for a soft glow when the balcony is at the front of the church. Make a short note about the rules to tuck into your purse or wallet. This way, you can reference the rules before you make a purchase of church decorations. 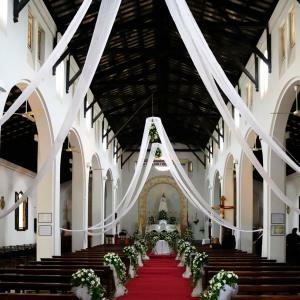 While it is easy to get caught up in decorating every area of the church, you'll want to stick to your wedding budget. 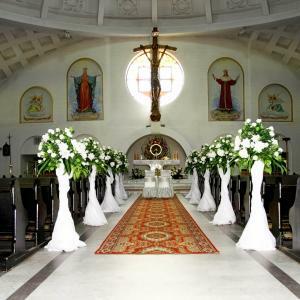 Pick and choose what areas to decorate: the altar is generally a must-do since all eyes are up front and photographs take place there. Skipping balconies and windowsills makes sense if you want to spend more money elsewhere. 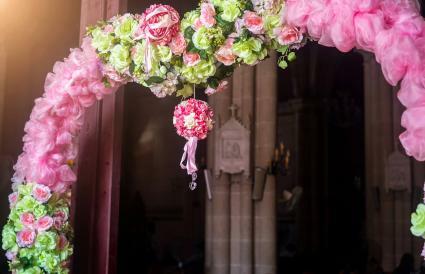 Look for ways to reuse the decorations at the reception as well, and you'll be on your way to decorating your church beautifully for a reasonable cost.